The feminine and flattering ALANA top is designed with a looser fit in mind. This comfortable and versatile vest is made with fantastic quality fabric, it feels soft to the skin and is designed to be worn with other tops and layered up. Perfect for all your training requirements, including running, gym classes, weights, pilates, boxing, pilates, yoga, balance, cycling and walking. Don't forget your sports bra! This vest does not contain an inbuilt bra so choose a contrasting Racer-back Bra Top for the layered look. Available in Jet Black, Aqua Blue, Yellow, Neon Red, Arctic White, Aqua Green, Brazen Orange and Strong Blue. Running September 2017 - Top Choice! 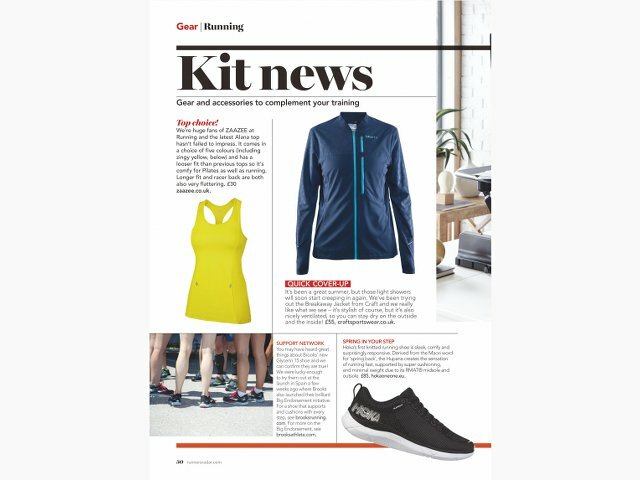 We're huge fans of ZAAZEE at Running and the latest Alana top hasn't failed to impress. It comes in a choice of 5 colours (including zingy yellow below) and has a looser fit than previous tops so it's comfy for Pilates and as well as running. Longer fit and racer back are both also very flattering. "Love these tops! Have the neon and the blue one and planning to buy more colours. Very comfy and after wearing them now for 6 months look like new! Great material, best tops ever!" "Best running tops ever!....comfy, flattering fit and wash like a treat!"